There is something in the air at Coconuts by the Sea that makes it a special place. Artifacts have been found on the property indicating that this site has been a gathering place for people for many centuries. So, if you are looking for a spiritual place to wind down or recharge your batteries, this just might be it. Yoga classes and massages are available. There’s lots to see if you are into nature or the environment. Every January and February, there’s whale watching, as the mamas and babies migrate north. You will see great pacific dolphins skipping through the water and, depending on the time of year, you may see giant sea turtles lay their eggs in the sand or you can help the hatchlings find their way to the ocean. The Pacific coast of Mexico is perfect for bird watchers, there are many species of birds to see, from delicate humming birds to squawking parrots to pelicans gliding over the surf looking for fish. Butterflies, too. You can walk to see crocodiles in their natural habitat. 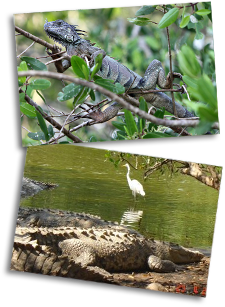 Iguanas, Silver tailed foxes, and Kuwaitis are occasional visitors. There is a jungle cruise out of Tenacatita that is great for nature lovers . Mangrove tours are available with experienced nature guides for a reasonable price. The mangrove is a haven for birds and bird watchers. At night, the whole sky is lit with a galaxy of stars, the full moon rising over the Bay of Tenacatita is a spectacular show. 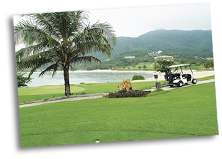 There are two world class golf courses located nearby – Isla Navidad at the Grand Bay resort in Barra de Navidad, and El Tamarindo Golf and Beach Club. Both of these courses have been given high marks by Golf Digest. Our fishing waters are some of the best anywhere, prompting the reputation of the “Sailfish Capital of the World”. Marlin, tuna, dorado and wahoo are also abundant in the area. Fishing trips are available at reasonable prices out of La Manzanilla, Barra de Navidad and Tenacatita. Kayak and paddle board rentals are available nearby – also surfing lessons. 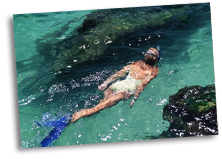 The snorkeling is wonderful. Just minutes away, at the awesome yellow sand beach of Tenacatita, you will find clear waters, luminous corals and spectacular tropical fish. 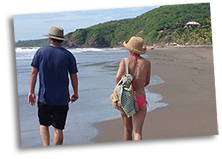 The beach in Boca de Iguanas is phenomenal, with gentle incline out to the surf, perfect for walking, running, or lounging under an umbrella. The ocean is great for body surfing, boogie boarding, or just swimming and splashing around in the water. There are two restaurants within very close walking distance . One is a world class restaurant with a famous chef from Toronto. 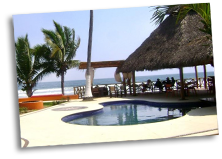 The other is a nice restaurant with a typical Mexican menu – Both are right on the beach so you can enjoy the sunset with dinner or take an ocean dip after lunch. The nearby pueblos of La Manzanilla, Barra de Navidad and Careyes offer excellent dining and shopping opportunities, typical of the local culture.